You DO NOT want to miss this!! This is not ONLY a Fashion Event!! This is a fashion inspired, culture and socially responsible, artistic, creative, professional and unique approach to a fashion show, at a great advanced ticket price. Are you ready to see what the ladies of C.E.N.T. (which I think should be called C - Ent, but they didn't ask me, lol) have prepared for you? The clothing sponsors are Off The HOOK and the production will be even better. Mark your calendars in your iPhones and Blackberrys. 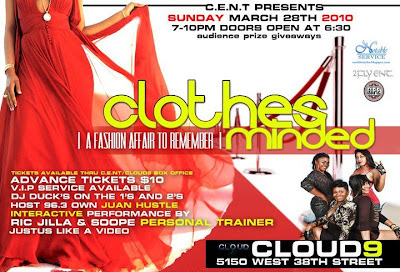 Clothes Minded "A Fashion Affair To Remember"
Online Tickets are available here or http://clothesminded.eventbrite.com/. For quick access to tickets, hit me on email here, and I will personally make sure you are taken care of. See you all there!